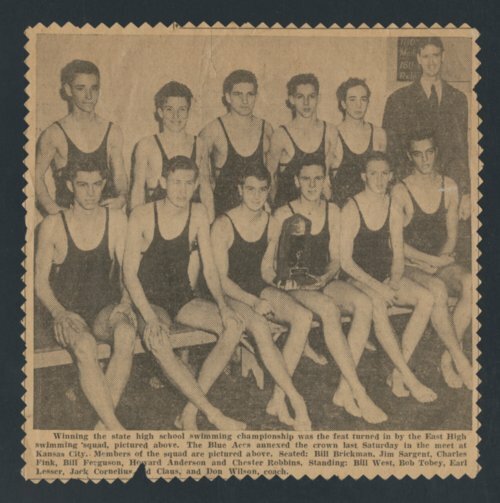 Here is a newspaper photograph showing the Wichita East High School state high school championship swim team. People in the photograph seated are (left to right) Bill Brinkman, Jim Sargent, Charles Fink, Bill Ferguson, Howard Anderson and Chester Robbins; and standing (left to right) William Thomas West, Bob Tobey, Earl Lesser, Jack Cornelius, ___ Claus, and Don Wilson, coach. Also, an article titled "Senior" with information on William Thomas West.